This information is intended for administrators and IT Pros. 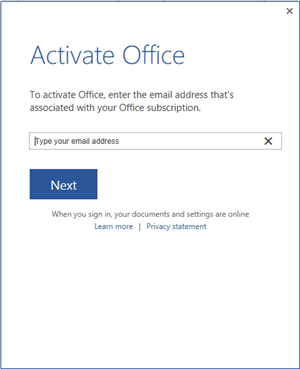 For information about activating a personal copy of Office, see Activate Office. Three workers at a factory share a computer, each worker using Office on that computer during their eight-hour shift. Fifteen nurses at a hospital use Office on ten different computers throughout the day. Five employees connect remotely to the same computer to run Office. Multiple employees use Office on a computer that's located in a conference room or some other public space in the company. Shared computer activation is used for situations where multiple users share the same computer and the users are logging in with their own account. If you have users who are assigned individual computers and no other users work on those computers, you use product key activation for Office 365 ProPlus. Normally, users can install and activate Office 365 ProPlus only on a limited number of devices, such as 5 PCs. Using Office 365 ProPlus with shared computer activation enabled doesn't count against that limit. If you have an Office 365 plan that includes Office 365 ProPlus, you can use shared computer activation. Make sure you assign each user a license for Office 365 ProPlus and that users log on to the shared computer with their own user account. You also can use shared computer activation to install Project Online Desktop Client or Visio Online Plan 2 (previously named Visio Pro for Office 365) on a shared computer, if you have a subscription plan that includes those products. Shared computer activation isn't available for Office for Mac. To enable shared computer activation when you deploy Office 365 ProPlus, you need the current version of the Office Deployment Tool, which is available for free from the Microsoft Download Center. The Office Deployment Tool, combined with a simple text file, is used to install Office 365 ProPlus on the shared computer, and to enable shared computer activation for that computer. Add the following lines when you create the text file. After Office 365 ProPlus is installed, you can verify that shared computer activation is enabled on that computer. If you've already deployed Office 365 ProPlus, you can enable shared computer activation on a computer by using Registry Editor to add a string value of SharedComputerLicensing with a setting of 1 under HKEY_LOCAL_MACHINE\SOFTWARE\Microsoft\Office\ClickToRun\Configuration. If you're using Microsoft Application Virtualization (App-V) to deploy Office 365 ProPlus, the registry location is HKEY_LOCAL_MACHINE\SOFTWARE\Microsoft\Office\16.0\Common\Licensing and it's a DWORD value. You can also enable shared computer activation by using Group Policy. If you're using Group Policy, download the most current Administrative Template files (ADMX/ADML) for Office and enable the "Use shared computer activation" policy setting. This policy setting is found under Computer Configuration\Policies\Administrative Templates\Microsoft Office 2016 (Machine)\Licensing Settings. Here's what happens after Office 365 ProPlus is installed on a computer that has shared computer activation enabled. A user logs on to the computer with her account. The user starts an Office 365 ProPlus program, such as Word. Office 365 ProPlus contacts the Office Licensing Service on the Internet to obtain a licensing token for the user. To determine whether the user is licensed to use Office 365 ProPlus, the Office Licensing Service has to know the user's account for Office 365. In some cases, Office 365 ProPlus prompts the user to provide the information. For example, the user might see the Activate Office dialog box. If your environment is configured to synchronize Office 365 and network user accounts, then the user probably won't see any prompts. Office 365 ProPlus should automatically be able to get the necessary information about the user's account in Office 365. If the user is licensed for Office 365 ProPlus, a licensing token is stored on the computer in the user's profile folder, and Office 365 ProPlus is activated. The user can now use Office 365 ProPlus. These steps are repeated for each user who logs on to the shared computer. Each user gets a unique licensing token. Just because one user activates Office 365 ProPlus on the computer doesn't mean Office 365 ProPlus is activated for all other users who log on to the computer. If a user goes to another computer that also is enabled for shared computer activation, the same steps occur. There is a different licensing token for each computer that the user logs on to. If a user logs on to a shared computer again, Office 365 ProPlus uses the same licensing token, if it is still valid. Licensing token renewal The licensing token that is stored on the shared computer is valid only for 30 days. As the expiration date for the licensing token nears, Office 365 ProPlus automatically attempts to renew the licensing token when the user is logged on to the computer and using Office 365 ProPlus. If the user doesn't log on to the shared computer for 30 days, the licensing token can expire. The next time that the user tries to use Office 365 ProPlus, Office 365 ProPlus contacts the Office Licensing Service on the Internet to get a new licensing token. Internet connectivity Because the shared computer has to contact the Office Licensing Service on the Internet to obtain or renew a licensing token, reliable connectivity between the shared computer and the Internet is necessary. Reduced functionality mode If the user is not licensed for Office 365 ProPlus, or if the user closed the Activate Office dialog box, no licensing token is obtained and Office 365 ProPlus isn't activated. Office 365 ProPlus is now in reduced functionality mode. This means that the user can view and print Office 365 ProPlus documents, but can't create or edit documents. The user also sees a message in Office 365 ProPlus that most features are turned off. Activation limits Normally, users can install and activate Office 365 ProPlus only on a limited number of devices, such as 5 PCs. Using Office 365 ProPlus with shared computer activation enabled doesn't count against that limit. Single sign-on recommended The use of single sign-on (SSO) is recommended to reduce how often users are prompted to sign in for activation. With single sign-on configured, Office is activated using the user credentials that the user provides to sign in to Windows, as long as the user has been assigned a license for Office 365 ProPlus. For more information, see Understanding Office 365 identity and Azure Active Directory. If you don't use single sign-on, you should consider using roaming profiles and include the %localappdata%\Microsoft\Office\16.0\Licensing folder as part of the roaming profile. Licensing token roaming Starting with Version 1704 of Office 365 ProPlus, you can configure the licensing token to roam with the user's profile or be located on a shared folder on the network. Previously, the licensing token was always saved to a specific folder on the local computer and was associated with that specific computer. In those cases, if the user signed in to a different computer, the user would be prompted to activate Office on that computer in order to get a new licensing token. The ability to roam the licensing token is especially helpful for non-persistent VDI scenarios. To configure licensing token roaming, you can use either the Office Deployment Tool or Group Policy, or you can use Registry Editor to edit the registry. Whichever method you choose, you need to provide a folder location that is unique to the user. The folder location can either be part of the user's roaming profile or a shared folder on the network. Office needs to be able to write to that folder location. If you're using a shared folder on the network, be aware that network latency problems can adversely impact the time it takes to open Office. If you're using Group Policy, download the most current Administrative Template files (ADMX/ADML) for Office and enable the "Specify the location to save the licensing token used by shared computer activation" policy setting. This policy setting is found under Computer Configuration\Policies\Administrative Templates\Microsoft Office 2016 (Machine)\Licensing Settings. If you're using the Office Deployment Tool, include the SCLCacheOverride and SCLCacheOverrideDirectory in the Property element of your configuration.xml file. For more information, see Configuration options for the Office Deployment Tool. To edit the registry, go to HKEY_LOCAL_MACHINE\SOFTWARE\Microsoft\Office\ClickToRun\Configuration, add a string value of SCLCacheOverride, and set the value to 1. Also, add a string value of SCLCacheOverrideDirectory and set the value to the path of the folder to save the licensing token. If you're using Microsoft Application Virtualization (App-V) to deploy Office 365 ProPlus, the registry location is HKEY_LOCAL_MACHINE\SOFTWARE\Microsoft\Office\16.0\Common\Licensing.